조선후기 고종(재위 1863∼1907)의 후궁 광화당 이씨가 입었던 원삼이다. 원삼(圓衫)이란 궁중의 왕비와 후궁의 예복으로 기본적인 구성은 황원삼이나 홍원삼과 동일하지만 후궁용 원삼의 두줄 직금색동을 제외하면 금직이나 금박의 장식을 볼 수 없어 신분적인 차이를 확인할 수 있다. 옷의 겉감은 자주색이고 안감은 홍색의 단에 남색 선을 둘렀으며, 소매 끝에는 남색과 황색의 색동을 대고 백색의 한삼을 대었다. 옷감의 무늬는 호리병수문, 만(卍)자가 들어있는 표주박문, 희(囍)문 등이 들어가 있다. 대(帶)는 홍색의 감에 구름과 봉황무늬의 금박이 찍혀 있으며, 앞여밈은 서로 마주 보고 여미게 되어있다. 금색의 사각 단추가 깃 바로 아래에 달려있다. 궁중의 법도에는 황후는 노란색의 원삼을 입었고 왕비는 붉은색의 원삼을 입었으며, 빈들은 자주색의 원삼을 입었다고 한다. 공주는 초록색의 원삼을 입었으며 서민가에서는 결혼식의 예복으로만 입었다. 특히 왕비나 후궁이 착용할 때는 5개의 발톱을 가진 용을 금실로 수놓고 원형의 보를 장식하는 등 화려함을 더하게 하였다. 광화당은 고종의 후궁이었으나 이 자색 원삼은 금실로 짜지도 않았고 금박도 찍혀있지 않아 다른 원삼에 비하여 화려한 느낌이 들지 않는다. 품계를 나타내기 위한 흉배(胸背)나 신분을 나타내기 위한 보(補)도 사용하지 않은 소박한 상태의 원삼이다. 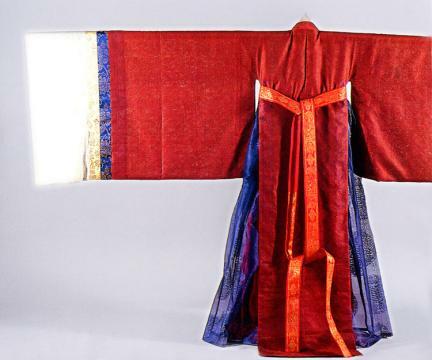 This wonsam belonged to Gwanghwadang, a royal concubine of King Gojong (ruled between 1863 and 1907) during the late Joseon period. 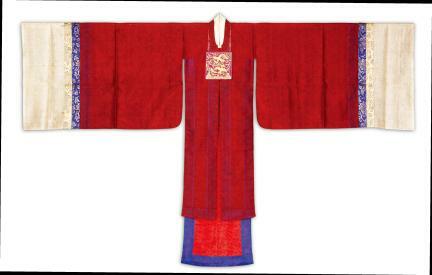 Wonsam is a formal dress worn by the Queen or royal concubines. Both yellow wonsam and red wonsam basically have the same composition, but the wonsam for royal concubines has neither gold threads nor gold plate decorations; thus showing social class differentiation. 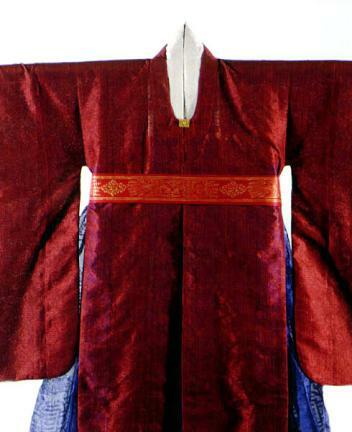 The outer cloth of wonsam for royal concubines is purple. The lining is red and bordered with deep blue line. 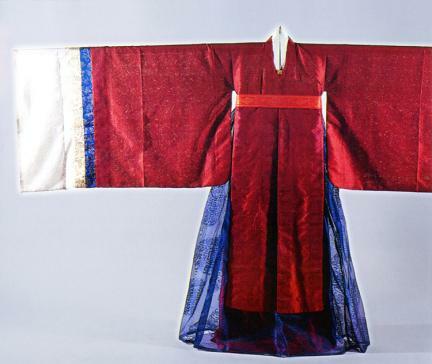 Deep blue and yellow saekdong (cloth of stripes of many colors) and white hansam are attached at the end of the sleeves. The gourd-shaped pattern, the Buddhist cross pattern, and the Chinese letter “happiness” pattern are used for this dress. The band with it has patterns of cloud and phoenix plated with gold on red cloth, and it can be adjusted in front. A gold-colored square button is attached right under the collar. According to the royal court custom, the Empress wears yellow wonsam, the Queen wears a red one, and the royal concubines wear the purple one. Princesses wear green wonsam, whereas common people wear it only during weddings and only as ceremonial clothes. In particular, the wonsam for the queen or concubines has the pattern of a dragon with five claws embroidered with gold threads, and it is decorated with a round insignia to add splendor. 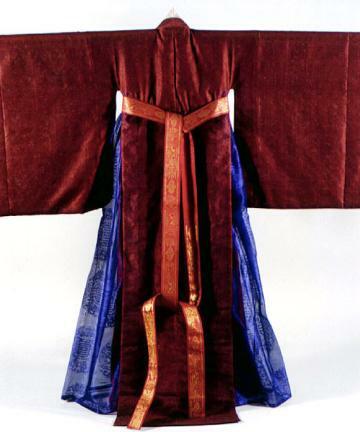 Gwanghwadang was a concubine of King Gojong, so this purple wonsam is not woven with gold threads, and it has no gold leaf patterns. 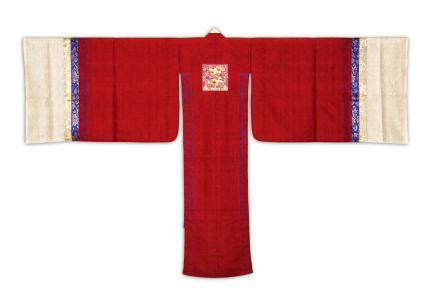 This simple wonsam has neither hyungbae (embroidered insignia on the chest and the back of an official robe) that represents an official rank nor bo that indicates social class.